All Singaporeans are meant to benefit from the Government's work, regardless of who they voted for, Minister for Social and Family Development Tan Chuan- Jin said yesterday. During a community visit to Serangoon, he said: "Our work as the Government doesn't stop because it is Aljunied. Every Singaporean matters." Mr Tan was speaking at a dialogue that wrapped up his visit to the division under the Workers' Party-run Aljunied GRC. He was asked by some residents when the People's Action Party would return to the constituency, which the opposition party won in the 2011 General Election. He told them that they have not been forgotten. "It is a democracy, we decide what we want to choose, you decide what you want to choose, for better (or) for worse... I can tell you we endeavour to do our best, no matter the outcome. "All of you remain Singaporeans. You don't vote for us, but we are here to still continue to provide policies which cut across every division, wherever you are," he told some 100 residents, students and business owners who were at the dialogue. He said that the aim of government policies is to benefit Singaporeans and Singapore as a society, and pledged that the Government will continue to strengthen its policies. During the session, Mr Tan also addressed concerns raised by residents, ranging from the availability of eldercare facilities to the use of electric scooters in the neighbourhood. Asked about his priorities at the Ministry of Social and Family Development, Mr Tan said that he hopes all Singaporeans will pitch in to help the less fortunate. "If they have problems, let us know... The moment we think that this is a job for social workers (only), I think we have lost our part in society to care for others," he said. Mr Tan, who also holds the Manpower portfolio until May 4, when he hands over to Mr Lim Swee Say, joined the MSF earlier this month. At the end of his visit, he told reporters that he received a "very warm" reception from the residents there. "There are, of course, usual local issues, some are municipal issues, which I guess is something the town council needs to settle, but nothing peculiar... 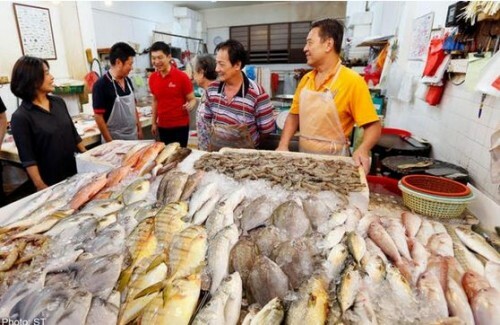 I get that in my own ward as well," said the Marine Parade GRC MP. He said that community visits are a good opportunity to meet people and hear their thoughts and views, and said the visit to Serangoon is not his first to Aljunied GRC. Over the past two years, he has also been to Kovan and Hougang Mall, and attended a Serangoon North National Day dinner. "We continued visiting... not because it is a general election or anything coming. We continue to keep our ears to the ground, working with our advisers who are here," said Mr Tan. Also at the event were People's Association special adviser Lim Boon Heng and the event's organising chairman Chan Hui Yuh. When asked by reporters about the PAP's election strategy for Aljunied GRC, Mr Tan said that the Government's work continues whether or not there are elections. Without giving away much, he said: "As for elections, we know it is going to come at some point, so strategy-wise, I guess we have to work that out. But our responsibilities as a government don't change."